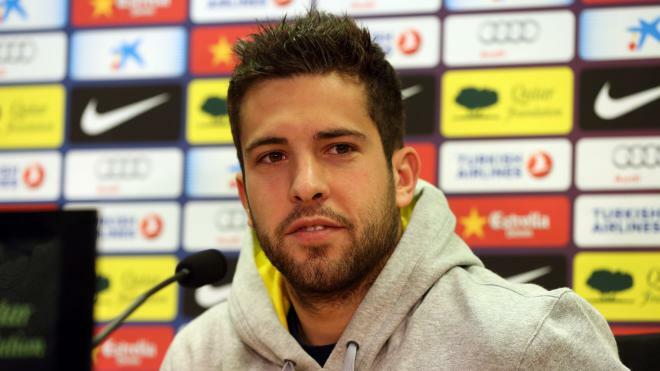 Jordi Alba Ramos (Catalan: [ˈʒɔrði ˈaɫβə ˈramos], Spanish: [ˈʝorði ˈalβa ˈramos]); born 21 March 1989) is a Spanish professional footballer who plays for FC Barcelona and the Spanish national team. Mainly a left back and a player of great speed, he can also operate as a left midfielder.He started his career at Hospitalet, but finished his development at Valencia (after a seven-year youth spell with Barcelona), rising to prominence in La Liga with the club. In 2012 he returned to Barcelona.Alba represented Spain at the 2014 World Cup and Euro 2012, having first appeared for the team in 2011. He won the latter tournament.